WheelScene was right in the middle of the action on Media Day at the 2018 Canadian International AutoShow (CIAS). With more than half of a million square feet of displays, exhibits and attractions, the Canadian International AutoShow is not only the largest auto expo in Canada, it is also an insight into the lifestyle, technology, and all things automotive for 2018 and beyond. WheelScene was there with our lens caps off and shutter fingers itching to capture the exciting Canadian premiere of 41 trucks, cars, and concepts, including the Canadian debut of the world’s fastest production car, the Koenigsegg Agera RS. 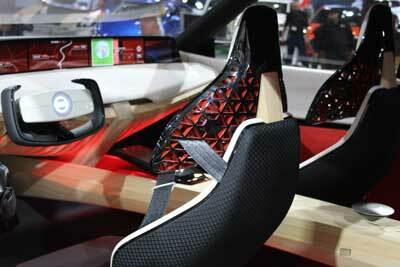 While the cars were the center of attention at the show, there were other displays worth mentioning too. We watched 10 finalists compete against each other in Forza Motorsport 7 on Xbox One for over $10,000 in cash and prizes. “Esports is one of the newest and fastest growing platforms that brands, sports franchises, and race organizers are using to engage young audiences,” said Jason Campbell, General Manager of the AutoShow. Using select BMW vehicles in a ‘King of the Track’ competition format, the quickest driver on each day of the AutoShow was invited back to the Grand Finale, which took place on Feb. 25, 2018. The winner of that event had the chance to compete against a professional driver in a double or nothing race-off. To say the automotive space continues to embrace esports for events, marketing, and fan engagement is an understatement. Esports and auto racing is already big, but it’s amazing to see how the rest of the industry adapts and supports competitive gaming for their brands. Expect to see esports playing a huge role in future auto shows around the world. Hot Wheels has been a huge hit with adults and kids alike, and the 50 Years of Hot Wheels display was a must-see attraction at CIAS 2018. 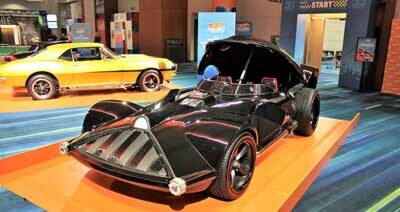 The exhibit included a Hot Wheels super track, a huge Hot Wheels display of collector cars and six life-size Hot Wheels cars, including the 1967 Chevrolet Camaro RS and the Darth Vader car. How does Volkswagen, a brand that has a long history of tradition but also a lot of excitement and attraction with younger consumers, evolve and continue being everything to both? We have to continue to modify, we have to continue to adapt to a change in marketplace. If you look on, at our product, every year we offer stuff that’s new, that’s what people are looking for, at least we hope, right? If they’re telling us that electric cars better be here sooner rather than later, well then we better invest in the electric car technology. The beauty is, being an established company that has a history of producing fine automobiles, we’ve got the car part down pretty well. And you’re gonna see that with the next couple of years, our launch of our all electric platform. We are [going to] make an absolute assault on the electric car industry. We want to be world number one in the short future, and you can only do that by providing what people are looking for. You alluded to some of the success that Volkswagen has been having. One of the key focus areas for WheelScene.com has been reporting on compact utility vehicles or CUV’s and crossovers. I was wondering if you could speak a little bit to Volkswagen’s strategy or successes around, specifically, CUV’s and crossovers? Consumers have decided that they want to ride higher, and that means they want the seating position afforded in a sport utility, or a small pick-up, or large pick-up, whatever, and we have four-wheel drive / SUV strategy that we embarked on already two years ago. We made 4MOTION all-wheel drive, that’s our tag line for all-wheel drive system. We made that available in our Golf SportWagen. The Golf SportWagen, a lot of people look at as the anti-sport utility. It doesn’t ride that high, but It’s the original combination of sport and utility. We also made available, another trim line, which we call Alltrack. We raised the suspension, we put some cool fender flares on it, so it’s now that true crossover, where it’s half-way between a car and a sport utility. Boom! Take another step and two months later we introduce a brand new Tiguan. Completely new platform, completely new chasseing, and new powertrains all designed to make the car bigger. Looking forward, we’ve got a whole host of new sport utilities coming up. Not just in North America but also worldwide. We’re not gonna stop there. We’re gonna go and combine the best of both worlds. Within about three years time, we’re gonna have a fully electrified sport utility vehicle. There you have it! From global insights from one of the biggest automakers, to the rise of esports in the automotive industry, to a celebration of 50 years of the toys that started our car obsessions, Hot Wheels: CIAS had it all and more! Todd started in the car industry at a young age washing cars and organizing parts. Early on he saw the importance the internet would play in shaping the future of the automobile industry. He has a BBA in Automotive Marketing and Management from Northwood University and thrives on combining his passion for automobiles with digital marketing. He is excited to see the future of electric, connected, and autonomous cars.